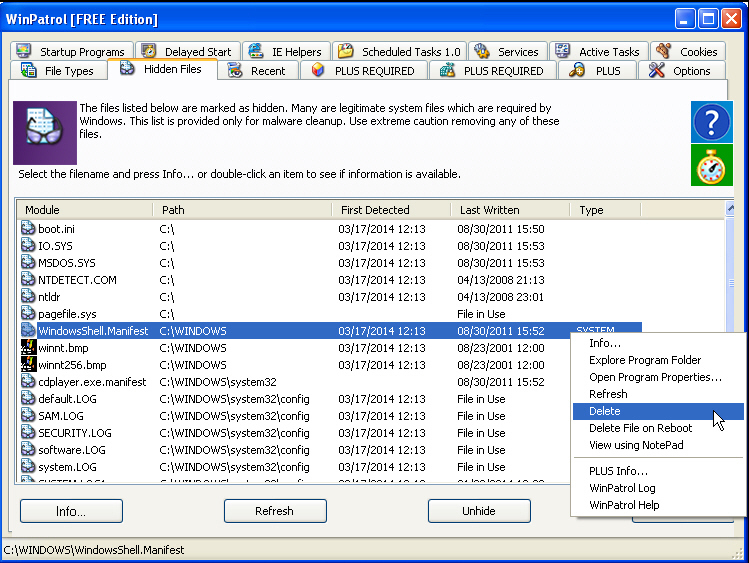 BillP Studios has updated its snapshot-based security tool for Windows with the release of WinPatrol 30.5.2014. The new incremental release comes with two major new features, plus an upgrade discount for XP users as End of Life approaches. Version 2014 also continues to tweak the positioning of dialog boxes and their components in response to user feedback, and has switched font to MS Shell Dig. The first new feature allows WinPatrol users to restore files previously deleted by the program. It came in response to radio host Kim Kommando’s warning about deleting certain files in WinPatrol because there was no way of easily restoring them. The new feature manifests itself in the shape of command-line scripts, which users can be run via Safe mode or the command line if necessary in order to restore the deleted files. The hidden files that WinPatrol deletes are now backed up to a special vault. The second new feature is restricted to users of the paid-for Plus version, and comes in the shape of a new "Check for Safe Updates" button. The button -- which was previously used to manually check for updates to WinPatrol itself -- now allows users to check for popular software updates too. WinPatrol will compare the version of programs installed on the user’s computer with what it terms as "safe" updates, then provide a link to the official download page for updating manually. Wary of fake websites and program installers containing potentially unwanted software, the new Safe Update Engine will alert users about these threats and provide sample screenshots of what they may expect. The Safe Update engine, which is present in the free version too, can also now detect users still running Windows XP -- it will provide a link to a special page that allows XP users to upgrade to the Plus version for additional protection for just $2. The update is rounded off with the aforementioned minor tweaks to the user interface. WinPatrol 30.5.2014 is available now as a free, function-limited download for PCs running Windows XP or later. A Plus version with additional functionality is also available, with prices starting from $29.95 (single user, unlimited computers) to $49.95 (whole family license).